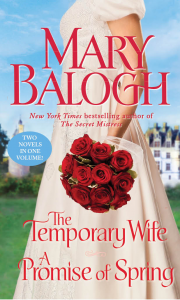 In The Temporary Wife, Anthony Earheart, Marquess of Staunton, has just been summoned home by his very autocratic father, the Duke of Withingsby, to marry the bride chosen for him many years ago. But Anthony has been bitterly estranged from his father and his whole family for eight years and decides to respond on his own terms. Rather than ignore his father’s summons or simply refuse to marry the girl chosen for him, he decides to take home a bride who will horrify his father’s exacting standards. And so he sets out to find a plain, impoverished brown mouse of a woman, and the best way to do it is to advertise for a governess. His plan is to marry her, flaunt her before his father, and then pension her off for the rest of both their lives. Charity Duncan is desperate. She has lost yet another job through her outspokenness, leaving all the burden of supporting their younger brothers and sisters and paying back their late father’s debts on her brother’s shoulders. Her brother wants her to go home to the children in the country and let him look after them all, but she is determined to find another job if she can. When she is summoned for an interview by Mr. Earheart, she puts on her best face, determined not to appear too bold. If she needs to appear to be a timid brown mouse in order to get employment, then a brown mouse she will be. In A Promise of Spring, the young vicar of Abbotsford has just been killed while rescuing a child from a charging bull, and he has left behind him a destitute sister, who was his housekeeper. The people of the village and surrounding areas rally around to help her, but Sir Peregrine Lampman, her brother’s friend, offers her marriage. There are a few problems. For one thing, they do not love each other or, indeed, even know each other well. For another, Grace has deep, dark secrets from her past, which she does not try to hide from him though she has told no one else. And for a third, Perry is ten years younger than she—twenty-five to her thirty-five. He persists and Grace is too grateful and too dazed by the death of her brother to say no. 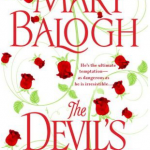 She assumes it is a marriage of convenience that he offers, but that is not his intention. They settle into a gentle marriage of apparent contentment until events even Grace could not have predicted bring ghosts of the past into the present and threaten the very fabric of their marriage. It being not quite the thing to advertise in the London papers for a wife, Anthony Earheart, Marquess of Staunton, eldest son and heir of the Duke of Withingsby, advertised instead for a governess. He advertised in his own name, with the omission of his title and connections, to the decided amusement of his friends and acquaintances, who rose to the occasion with marvelous wit. “But it is hardly fair to everyone else’s by-blows if all the positions are filled by Staunton’s,” the colonel said, speaking with an exaggerated whine of complaint. The Marquess of Staunton did not participate in the conversation beyond the occasional lifting of an eyebrow or pursing of the lips. He looked on as if he were nothing more than a mildly interested observer. He had no children as far as he knew. He had no estates—yet. He had tired of Anna after only six weeks and was in no hurry to employ a replacement. Mistresses, he was finding, were less and less able to satisfy his jaded appetites. He knew all their tricks and skills and was bored by them—Rowling was wrong about there being more to learn. He had no dealings with any of his nieces—or nephews either, for that matter. No, he was not in search of either a governess or a mistress. He was choosing himself a wife, as he made clear to Lord Rowling when the two of them were strolling homeward later. “Is that not usually done at Almack’s or in someone’s ballroom or drawing room?” Lord Rowling asked, chuckling as if he believed the whole matter was a joke devised for his amusement. “And without the necessity of an advertisement, Tony? You are Staunton, after all, and will be Withingsby one day. You are as rich as Croesus and have the looks to turn any female head even if you were a pauper. Yet you have advertised for a wife in the guise of a governess? What am I missing, pray?” He twirled his cane and touched the brim of his hat to a lady whom they were passing. “Why not?” Lord Staunton asked. “But a man craves heirs of his own body,” Lord Rowling said. Lord Rowling would have liked to continue the original conversation until he had talked some sense into his friend, but he was soon conversing about horses. After all, he had known the Marquess of Staunton long enough to understand that he had a will of iron, that he said and did exactly what he wished to say and do without reference to other people’s preferences or to society’s dictates. If he had decided to choose a wife in such an unconventional manner and for such a cynical, cold-blooded reason, then choose her he would, and marry her too. The Marquess of Staunton meanwhile, although he talked with enthusiasm about horses and then the races, inwardly contemplated with some satisfaction his return to Enfield Park in Wiltshire and the effect of that return on the Duke of Withingsby. It would be the final thumbing of the nose to the man who had begotten him and made his life miserable for the twenty years following his birth. For eight years, ever since he had left home after that final dreadful scene, he had lived independently of his father, refusing any financial support. He had made his own fortune, at first by gambling, then by reckless investments, and finally by more prudent investments and business ventures. His father had clearly not got the point. But he would. He would understand that his eldest son was once and for all beyond his power and influence. Oh, yes, marrying imprudently—and that would be an understatement for the marriage of the Duke of Withingsby’s heir to an impoverished gentlewoman who had earned her living as a governess—would be the best possible thing he could do. He longed to see his father’s face when he took his bride to Enfield. And so he waited for replies to his advertisement, replies that began coming in the very day after its first appearance in the London papers and kept coming in for several days after that in even larger numbers than he had expected. He rejected several applicants, sight unseen-all those below the age of twenty or above the age of thirty, those with particularly impressive recommendations, and one young lady who so particularly wished to impress him with her knowledge of Latin that her letter was written in it. He interviewed five candidates before discovering his quiet mouse in the sixth. Miss Charity Duncan had been shown into a downstairs salon and had chosen to stand in the part of the room that was not bathed in sunlight. For one moment after he had opened the door and stepped inside the room he thought she must have changed her mind and fled. But then he saw her, and it struck him that even her decision to stand just there was significant. In addition she was dressed from head to toe in drab brown and looked totally self-effacing and quietly disciplined. She was the quintessential governess—the sort of employee even the most jealous of wives would not object to having in the same house with her husband. “Yes, sir.” Her voice was quiet and low-pitched. She curtsied to him without once raising her eyes from the carpet before her feet. She was on the low side of medium height, very slender, perhaps even thin, though her cloak made it impossible to know for sure. Her face looked pale and ordinary in the shadows. The brown of her hair blended so totally with the brown of her bonnet that it was difficult to know where the one ended and the other began. Her garments were decent and drab. He was given the impression that they were not quite shabby but very soon would be. They were genteel-shabby. She was perfect. His father would be incensed. “Please be seated,” he said, indicating a chair close to where she stood. “Yes, sir,” she said and sat down, as expected, with a straight spine that did not touch the back of her chair. She folded her gloved hands in her lap and directed her gaze modestly at her knees. She was the picture of prim gentility. She was quite perfect! He decided there and then that she would do, that his search was at an end. He was looking at his future wife. When the Reverend Paul Howard, rector at the village of Abbotsford in Hampshire, died at the age of two-and-thirty years, his death caused considerably more stir than his life had ever done. He had been a gentle, studious man, revered as a saint, honored as a guest, coveted as a visitor to the sick, and largely ignored as a preacher. It was the least of their troubles, the elder Miss Stanhope had once remarked to Mrs. Cartwright, to be forced to sit through the hour-long sermon each Sunday when one only had to look at the reverend’s face to know that the Almighty had sent them one of his blessed angels in disguise. In death the rector was lifted once and for all beyond the ordinary. Mrs. Cartwright told several of her acquaintances in some awe that Miss Stanhope’s words had been prophetic. The Reverend Howard was walking home after visiting one of the cottages beyond the village, his nose in a book as usual, when the screaming of children had penetrated his consciousness and he had looked up to see one small child in a forbidden field, cornered by a bull that someone had obviously been annoying. The rector hurled his precious book to the dust, roared with greater ferocity than anyone would have guessed him capable of, vaulted over the wooden fence with more agility than he would have thought possible, picked up the child and lowered him gently over the fence to join the other screaming youngsters, and turned to face the bull—for all the world like David about to take on Goliath, Mr. Watson, the farmer poet, said afterward, though Mr. Watson had not been present to witness the incident. Only the children had. Unfortunately, the Reverend Howard did not possess a slingshot as David had done. He was dead probably even before the terrified children turned and ran screaming toward the village and help. He became an instant martyr, a man who had given his life for a child. The poor bull survived him by only a few hours. But the people of Abbotsford and the surrounding countryside were not allowed to bask in the glory of such a sensational tragedy. They were faced with a very practical problem. Their rector had left behind him an unmarried sister. A destitute sister, as far as anyone knew. She had come with her brother five years before to live at the rectory as his housekeeper. Neither had spoken of any other family members. It was assumed that there were none. And the Reverend Howard had not been a wealthy man. He had been in the habit of giving away almost more than he possessed, so that Mrs. Courtney and Mrs. Cartwright were agreed that it was a wonder Miss Howard found anything in the rectory kitchen to cook. Perhaps like angels the two of them lived on air. In the days following the death of her brother, Grace Howard seemed unaware of the unenviable position in which his heroism had placed her. Always quiet and dignified, she seemed now wholly turned to marble. Paul had been all she had left. Now she had nothing. No one. She could not think beyond that deadening fact to consider also that she now had nowhere to go and no means by which to live. But the people about her were by no means so unaware or so apathetic. Miss Howard’s brother had died in order to save one of their children. Miss Howard must be looked after. Most of the ladies nodded to indicate that, yes, indeed, Miss Howard might be too proud to accept such a generous offer. The poorer people of the village, those who worked as laborers for the Earl of Amberley, took up a collection of food and money, which they planned to present to Miss Howard after the funeral. But they knew that such a gift, although a sacrifice to them, would not solve her problem for longer than a week or two at most. The Countess of Amberley broached the subject to her son the earl as he sat with her in the conservatory at Amberley Court after they had returned from a visit to the rectory. Sir Peregrine Lampman did not consult with anyone on what should be done about his friend’s sister. He paid a call on her the morning after the funeral, after the bishop had left and before his neighbors and friends could put into effect any of their less-than-satisfactory suggestions for Miss Howard’s future. And he asked her to marry him.